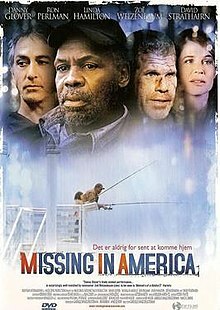 Missing in America is a 2005 drama film, directed, produced, and written by Gabrielle Savage Dockterman. It is based on a story by Ken Miller, a former Green Beret who was a helicopter pilot in the Vietnam War. The film debuted at the Seattle International Film Festival in May 2005. Jake refuses, but Henry leaves in the night, leaving his daughter behind and giving Jake little choice but to look after her. Lenny proves troublesome for Jake, and interrupts his normal way of life. Over time however, Lenny encourages Jake to reach out to other Vietnam veterans who are living nearby in self-imposed exile.